Due to health issues we are unable to process requests for tracts until the end of January 2017. We trust that you will understand this. As an alternative, you can download the PDF files from the link for each tract, and can then arrange printing locally. We have now closed off tract orders for 2014, and will be restarting to process orders for 2015 towards the end of December 2014. We would like to thank all who support us, and pray that your Christmas evangelistic programmes will be blessed and fruitful. We recently had some interesting news from London. A friend wrote the following email: "Some months ago, I saw some of your tracts in my area, picked them up from the street and redistributed them". God's word never returns void, and our tracts can used time and time again! December is almost here, and Christmas is a great opportunity to share the good news of Jesus Christ through our Christmas tracts. We now have our Christmas tract in English, Spanish, German and French (you will need to request German and French Christmas tracts by emailing us using the contact form, rather than ordering from the web page). Christmas time is a busy period for postal systems world wide, so if you wish to receive some tracts for distribution before December 25th, you will need to submit your request by the 16th of November. Dr Lloyd-Jones is widely regarded as one of the twentieth century’s greatest expository preachers. All his books are transcripts of his sermons or lectures. This book is based on five sermons he gave in Edinburgh, Scotland in 1941. Dr Lloyd-Jones gave these sermons soon after the start of World War 2 where the whole question of evil, sin and the plight of man were hot issues. He bases his sermons on Romans 1:16-21,28 and verse 32. This is the classic passage regarding the sinfulness of man and why the gospel is the answer. Dr Lloyd-Jones first makes the most of his medical training and argues that a superficial diagnosis never helps the patient; in fact it is harmful. During World War 2 academics were suggesting many reasons for the obvious evil of the war but constantly made superficial diagnoses. Dr Lloyd-Jones got to the heart of the issue and showed that mans nature is sinful. This is the disease that needs curing. Romans 1:18 teaches that the wrath of God is revealed from heaven because of sin. God is light and in Him is no darkness at all. God’s justice, holiness and righteousness demand His hatred of sin. However there is hope. There is salvation for sinners in the person and work of the Lord Jesus Christ. The gospel is the power of God to salvation. God has dealt with sin through the person and work of Jesus Christ. In Christ the demands of holiness and justice have been satisfied. God in Christ offers pardon and forgiveness. This book has two particular uses. It is a helpful book to clarify the truths of the gospel in the readers mind. Further, its clear gospel message makes it an ideal book for personal evangelism. Highly recommended. Spurgeon, Charles. H. (2011/1883) Spurgeon’s Sermons. Massachusetts: Hendrickson. 5 volumes. Charles Spurgeon was, without question, the greatest preacher in the 19th century church and still widely regarded as one of the greatest Christian preachers of all time. This set of sermons was originally published in 10 volumes by a New York Publisher in 1883. The present Hendrickson reprint has conveniently reprinted the 10 volumes in 5, making this a nice collection of some of the classic Spurgeon sermons. The full set of Spurgeon’s sermons numbers over 60 volumes. If one wants to read the best of Spurgeon’s sermons without the big job of reading 60 plus volumes, this is the ideal set to have. Spurgeon was a ‘topical’ preacher rather than an ‘expository’ preacher. Therefore this set contains a vast array of biblical topics rather than an exposition of specific passages of scripture. That said, Spurgeon was also a doctrinal preacher so each preached sermon is rich in biblical truth, doctrine and practical application to the Christian life. The reader will find a rich discussion of many biblical truths. Spurgeon excelled in bringing the truth of the scriptures alive to the Christian. Most of these sermons appear to be in the earlier years of Spurgeon’s ministry – roughly the period 1850-1860. The American publishers selected the “cream of the crop” of his many sermons which add to their value. The final volume includes a scripture and topic index. I highly recommend these volumes. They are a fine introduction to Spurgeon’s sermons and his theology. More information on Spurgeon can be found at the official website http://www.spurgeon.org/mainpage.htm. These two volumes constitute the authorised biography of one of the greatest leaders of the church. Dr Martyn Lloyd-Jones was born in Cardiff, Wales in 1899. He trained at St Bartholomew’s Hospital – one of the greatest medical institutions in Britain. He studied under Sir Thomas Horder – one of the most brilliant medical men at St Bartholomew’s. As a young man, Dr Lloyd-Jones came under the conviction of sin and saw his need of a Saviour. Although a brilliant medical man, he saw that mans real problem was spiritual not medical. Man needs to be reconciled to God. The conviction of Dr Lloyd-Jones that mans major problem is spiritual led to a major decision – he would leave medicine with all its privileges and honour and become a preacher of the gospel. His first pastorate was in the poverty-stricken town of Port Talbot, Wales in 1927. The same year he married Bethan Phillips – herself a medically qualified professional. God greatly blessed this ministry in Port Talbot and many were brought to faith in Christ. The biography details many amazing conversions from drunkenness, profanity and the like. In 1938 Dr Lloyd-Jones became minister of Westminster Chapel in London alongside Campbell Morgan. Volume 2 “The fight of faith” continues the story. World War 2 created trying circumstances for the ministry at Westminster Chapel. Reduced church numbers and reduced church funds meant it was difficult to sustain two ministers. Eventually Campbell Morgan retired and Dr Lloyd-Jones became the sole minister until 1968. After World War 2, Dr Lloyd-Jones main priority was to build up the congregation at Westminster Chapel. He did this through doctrinal and expository preaching. He upheld the authority of the Bible believing it is “living and powerful, and sharper than any two-edged sword” (Heb 4:12). Dr Lloyd-Jones also ran a Friday evening fellowship where he encouraged people to carefully think through doctrine and also practical aspects of Christianity. However in 1952 he changed the format and gave a series of lectures on Bible doctrines which were a blessing to many. These lectures have been formatted into a book “Great Doctrines of the Bible” (Crossway Books) which are highly recommended. He followed this with his powerful lectures on the book of Romans. Chapter 13, Sunday mornings in the 1950’s gives an insight into how Dr Lloyd-Jones led the worship services. Dr Lloyd-Jones used a traditional Reformed liturgy which gave coherence to the whole service. Scripture readings, prayers and hymns were just as important as the preaching of the scriptures. In 1959 Dr Lloyd-Jones preached his classic services on Revival. He held to the classic view of Revival, namely that Revival is a sovereign work of the Holy Spirit, not something created or “worked up” by man. Dr Lloyd-Jones retired as minister at Westminster Chapel and carried on an itinerant pastoral and preaching ministry until 1980. He died in London in 1980 and was buried in his beloved Wales. The final chapter, “the best of men” summarises the significance of Dr Lloyd-Jones as a man and also why his ministry was so effective. He was a very gifted man with a mind of enormous capacity and energy. Often men see issues in fragmented parts but Dr Lloyd-Jones was often able to see the whole and put details in their proper perspective. Divine providence also guided him so that he continued to promote the sovereignty of God in his ministry and steer people away from error. Finally and very importantly, Dr Lloyd-Jones was a spiritually mature and godly man – indeed a spiritual giant. The book contains 6 appendices containing various theological issues plus guidance on reading Dr Lloyd-Jones sermons. Tell the Truth is one of the most comprehensive and biblically faithful books on personal evangelism known to this reviewer. The book places a heavy emphasis on the truth and message of the gospel. The reason for this is that so much that passes for the gospel today is a watered down message that does little good. Therefore, for the eternal good of the souls we reach, we need to know the full gospel to be effective as servants of Christ. Part 1 of the book discusses the content of the message. The scriptures warn us that we must be aware of a false profession of faith as well as true saving faith. For example, the parable of the sower (Matthew 13:1-23) teaches that it is possible for the gospel seed to land on stony ground and thus not be true saving faith. There is a danger of people thinking they are Christians when they are not! Biblical evangelism involves the whole person – mind, emotions and will. Truth must first come to the mind, which will touch the emotions and set the heart on fire. Part 2 discusses the biblical concept of grace and why it is crucial for evangelism. Metzger helpfully discusses Ephesians 2:4-5,8-9 which teaches that because of His great love for us, God who is rich in mercy made His people alive and saved them by grace. God’s sovereign will empowers the dead will of sinners and gives them a new heart. This part concludes with a helpful chapter on worship. A personal encounter with the living God will be an encounter to love and adoration – to worship. Part 3 looks at how to witness. Some helpful advice is given on how to evangelise in a post-modern world. There is such a thing as absolute truth – the truth of God’s revealed word - even if that statement is intolerant. Metzger emphasises that we must proclaim the gospel to post moderns with love. Love overcomes accusations of intolerance. Then, some helpful advice is given on how to build relationships with people and develop common interests with the goal of making disciples. All in all this is a very helpful tool. It pays to read the appendixes alongside the main material in the book to gain full benefit of the books teaching. The purpose of this book is to demonstrate the power of scripture in defending the Christian faith. In the introduction, Oliphint quotes 1 Samuel 17:47 to remind us that when we witness to people and defend the faith, the battle ultimately is the Lords. There is a spiritual battle going on the defence of the faith. There is no neutral ground. We must fight this battle with God’s weapons – the revealed Word of God and in the power of the Holy Spirit. This must be done in the meekness and gentleness of Christ Himself. Oliphint continues with a helpful discussion of Romans 1:18-21 and shows its important implication for apologetics. Paul makes it clear that all humanity knows God but they suppress this knowledge by their sin. This is an important apologetic insight. When we defend the faith, we speak to people who are not ignorant of our God. Paul says in this passage that God’s attributes are clearly seen. Psalm 19 tells us that the heavens declare the glory of God ad the sky proclaims His handiwork. Therefore we know from scripture that the unbeliever puts on a mask (sin) to hide the truth God has revealed to him in creation. Hence we must use persuasion. Because humans are made in the image of God, there is truth within him that God has graciously given him. We appeal to that truth the unbeliever already knows. This can lead into a clear gospel presentation. Oliphint includes a helpful discussion on how Paul used persuasion when preaching to the pagans in Acts 17. Appendix 2 is a list of scripture passages that give valuable insight into apologetics. The book includes study questions at the end of each chapter making it ideal for group or personal study. There are also helpful insights throughout the book showing how to link apologetics with evangelism. This is a fine introduction to Christian apologetics. John MacArthur has been a faithful minister of Christ’s church for many years. Hence, when he writes a book on an important subject such as worship one knows it will be spiritually edifying! Indeed, this is a very helpful book. This book was originally published in 1983 but has been recently revised with an extra chapter and an appendix added. The major theme that runs through this book is that God must be worshipped in the way prescribed by Holy Scripture. Idolatry is an ever present danger. Scripture alone determines the way and manner in which a sinner should approach God, and worship Him. MacArthur argues that this is why a church should have a Biblical expository preaching ministry. The scriptures must be preached (2 Timothy 4:2). Genuine worship is a response to divine truth that God has revealed about Himself. The book includes with some insights on how to glorify God. Psalm 100 reminds us that God has made us and we are His. God made everything to give Him glory. The appendix is a plea to promote content, truth-focused Psalms, hymns and spiritual songs in the church. All in all this is a very helpful book. It reminds us that we cannot worship God on our own devices but God is to be worshipped as He commands – as revealed in the Scriptures. May this book help to that end. Dr Lloyd-Jones is widely regarded as one of the twentieth century’s greatest expository preachers. All his books are transcripts of his sermons or lectures. This book, Authority, is based on three lectures he gave to a student conference in Canada in 1957. This issue of authority is important because man is constantly searching for ultimate truth – ultimate authority. Humans do this through various religions and cults, and philosophy and reason. However, one cannot arrive at this ultimate knowledge by ones own efforts. The apostle Paul stated that the world did not know God through wisdom (1 Corinthians 1:21). Lloyd-Jones adds “the world by wisdom still does not know God!” (P12 Emphasis by Lloyd-Jones). The New Testament shows a clear witness to Christ’s authority. The gospels show the authority of our Lord in His baptism where the Holy Spirit descends upon Christ and a voice from heaven says “This is my beloved Son”. (Matthew 3:17). Similar words are uttered at the Transfiguration, but an extra note of authority is sounded “listen to Him” (Matthew 17:5). Christ claims to be “the way, the truth and the life (John 14:6). Christ also demonstrated His authority in His death, resurrection and ascension. The Scriptures themselves attest to their own authority. Our Lord accepted the authority of the Old Testament and testified that they spoke of Him (Luke 24:44). Although there are many arguments that verify the authority of the scriptures, in the final analysis the truths of the Scripture are spiritually discerned (1 Corinthians 2:14). It is the preached word and the work of the Spirit that ultimately convinces a person of the authority of Holy Scripture. Dr Lloyd-Jones explains how the authority of the Holy Spirit shows itself in the life of our Lord. God gave Christ the Spirit in complete fullness for the task (John 3:34). Next, Dr Lloyd-Jones explains how the Holy Spirit shows authority in the life of the believer. The Holy Spirit alone can open the heart and enable one to receive truth. He then gives understanding and assurance to the true believer. Finally, Dr Lloyd-Jones teaches on the work of the Spirit in the church and especially the importance of revival. This is a very helpful small book. It is especially helpful as an aid to defend the faith while evangelising or to strengthen the faith of a believer. 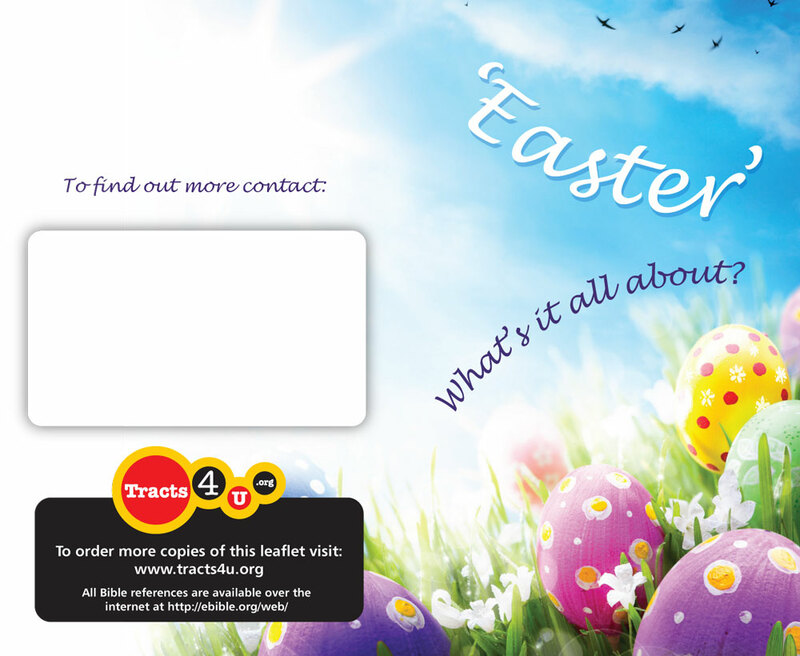 We've now got plenty of Easter tracts, and just want to remind friends that if you want to receive any tracts to use for Easter outreach, you will need to order them through the websitewww.tracts4u.org by February 28 2013. Xiong Jing was once a member of a triad gang. His life was full of criminal activity. But all that changed on the day he was handed a Gospel pamphlet on the street. Even though Xiong Jing didn't understand what he was reading about, he began asking around his neighbours to see if any of them could help him. An elderly neighbour offered to take him to church the next Sunday. He agreed to go, and there he was given a Bible, which he took home to read. He began reading the Bible at the Gospel of Matthew. At first, Xiong Jing found it difficult to understand, but he persevered until he got as far as the Sermon on the Mount. At that moment he felt as if a lightning bolt had struck deep into his soul. It was almost as if he heard the voice of jesus. He read on and on, late into the night. it was from that point on that Xiong Jing's life began to change in dramatic ways that soon became noticeable in his home and neighbourhood. He began attending church regularly, and it soon became clear that his life had been transformed from gang-centred to Christ-centred. So, from the tiny seed of a Gospel tract sown on the street that day, there blossomed an interest in knowing about God, Jesus Christ and the way of salvation.This then led to a life transformed through the saving power of the good news of salvation through Jesus Christ. Who knows what effect simply giving a tract to someone may have in your neighbourhood! This classic work is all about implementing wise spiritual disciplines into ones Christian life. It is based around the teaching of 1 Tim 4:7 “discipline yourself for the purpose of godliness” [NASB]. Each chapter is devoted to a specific spiritual discipline and includes biblical teaching on that discipline as well as practical application. Two chapters are devoted to Bible intake. These include bible reading (including advice on a good Bible reading plan), memorisation of scripture and meditation. The section on meditation is especially helpful as this is an area often not addressed in modern Christian churches. Whitney states that Meditation involves deep thinking on the truths and spiritual realities of scripture. The book goes on to explain the importance of prayer for the Christian life. Just as scripture memorisation enhances meditation, so meditation enhances prayer. Letting scriptural principles flow through the mind helps one to pray effectively. Next, worship is discussed. Worship is focusing on and responding to God. John 4 emphasises that it must be done in spirit and in truth. Other spiritual disciplines discussed include evangelism, serving others, stewardship of time and money, fasting, silence and solitude, and journaling (to record thoughts on your personal walk with God). Whitney emphasises the fact that these disciplines are to help with spiritual growth – thus they should not be seen as legalistic duties. Whitney has written a sequel to this book “Simplify your Spiritual Life” (also published by NavPress). This book includes some of the above disciplines but often discusses them from a slightly different angle. For example, it gives some new insights and tools for scriptural meditation. Simplify your Spiritual Life also contains new material. This includes advice on singing hymns, getting a spiritually wise person to help in your Christian walk, using the Lord ’s Day to enhance your spiritual life and how to use modern technology wisely. This reviewer suggests that, because of the complementary nature of both books, they should be read together. May they be a helpful tool to “discipline yourself for the purpose of godliness” 1 Tim 4:7. The author has a website with useful material http://biblicalspirituality.org. We have a friend who reads lots of good books on a variety of Christian subjects, and we have asked him to write reviews of some of these books so that we can share them with you.. The first one is a review of a Francis Shaeffer Trilogy - a combination of three of Shaeffer's most important writings. Schaeffer starts this work off by explaining that the thinking of mankind went on a significant change about the turn of the twentieth century – first in Europe, then in the USA. Prior to the twentieth century the dominant thinking was that absolute truth existed but it could be found apart from the Scriptures. The humanists of the time mocked the bible as being inconsistent with absolute truth. However the problem was that this optimistic humanism had no foundations to build on and ultimately collapsed. As a result a new worldview developed – the idea that there is no absolute truth. Schaeffer calls it “going beyond the line of despair” because this modern view is irrational and cannot build a solid foundation for anything. To give an obvious example – if I said there was no absolute truth, obviously that statement is self-refuting because I have made a truth statement. The rest of this book (3 books combined) develops this theme. Book 2 demonstrates how modern man has become irrational because of this modern thinking. Book three ties all the themes together by showing from the scriptures that modern man need not be in despair because God is not silent – God indeed does exist and has revealed Himself. He has spoken through the pages of Holy Scripture and therefore there is hope – both spiritually and philosophically – for modern man. Schaeffer gives a very clear description of the gospel. He points out that the gospel is the way that man is reconciled with God and that he comes to God not on his own righteousness, but on the righteousness of Christ. Some very helpful guidelines are given on how to reach people in our post-modern society. Schaeffer suggests we “find the point of tension”. For example, if you are witnessing to a person concerned with social justice, you would challenge them as to the foundations for social justices on a humanistic foundation. Schaeffer calls this the “point of tension” because this person obviously believes in ultimate standards (in this case social justice) and yet is unable to find a foundation for this apart from biblical foundations. This is a helpful tool to challenge and reach people. It is quite clear through the book that Schaffer has a great love for people because they are made in the image of God. This sets us a high standard as we witness. One of Schaeffer’s unique gifts was effective communication. Some of the concepts in this book grapple with serious issues in philosophy. Yet Schaeffer explains his terms well and uses helpful diagrams to help the reader understand the key concepts. Further, there is a glossary included in the book. I highly recommend this book. It is a helpful tool for witnessing to non-Christians, and can help people think through the issues of their faith. Recently, Trevor went to one of our local shopping centres to talk to people and hand out tracts. He had a blessed time. 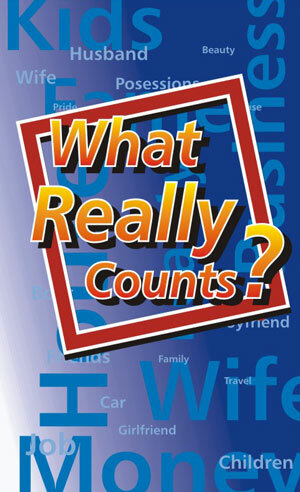 We've just done a stock take, and find that we are low on some of our most popular tracts, including "Four Things You Need To Know" and "What Really Counts". We're planning to do another print run in the next couple of weeks so that stocks are replenished. We are so thankful to the Lord that we are able to provide tracts to so many countries worldwide. We would also like to thank those who request and use the tracts, as well as those who have supported us financially, in prayer and with words of encouragement - we are partners together in evangelism! Some of our tracts are included in a free iPhone app called mobitract. Our new Easter tract has been printed and can be ordered. For people from countries outside New Zealand, we need to have orders within the next week as it will take 7-10 days for mail to reach you. Yesterday we finalised the content and layout of a new tract about the meaning of Easter. We should have it on the website soon, so watch this space! See this story on Christian World News about an elderly Brazilian lady who has been evangelising in New York for the last 40 years by handing out tracts and talking to people. On 18-20 November 2011, Austin Walker, pastor of Maidenbower Baptist Church, Crawley, Sussex, England will be speaking at a conference, which has as its theme “Solid Joys and Lasting Treasures” (Romans 8:31-39)". The conference venue for Friday, 18 November 2011 and Saturday, 19 November 2011 is Trinity Methodist Church Hall, 474 Pakuranga Road, Highland Park, Auckland, and for Sunday, 20 November 2011 is Sovereign Grace Church (Reformed Baptist), 3 Lunn Avenue, Mt. Wellington, Auckland. To check out the conference details, go to the Sovereign Grace church website. 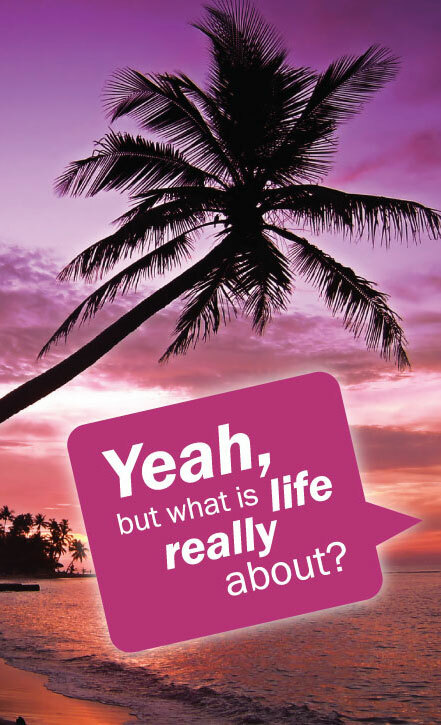 Yeah, but what is life really about? "Yeah, but what is life really about?" is the title of our latest tract. It challenges those reading it to think about the Bible and what it teaches about God, creation,why we are here and where we are going, about sin and about Jesus Christ, the Son of God. Check it out! We will soon have Brazilian Portuguese translations of some of our tracts available on line. We have just uploaded an online Burmese translation of our tract "Four Things You Need To Know". Many thanks to Ivan Edwards, who kindly provided the translation for us. This version is not available in print format. Click here to view. The Kenyan Swahili translation of "Four Things You Need to Know" is now online (not available as print, though). Click here to view. We've recently received a German translation of three of our tracts, and we are looking into Swahili, Urdu and Burmese translations, as well. This is based on requests for such tracts. In addition, we're working on an Easter tract. We just praise God for the encouragements we've received in the past few weeks. Just wanted you to know I received the gospel tracts yesterday. They were wonderful and I loved the message that was in each one. The first one I gave was to my grandaughter who is 12. Her favorite scripture has always been John 3:16 "For God so Loved the world that he gave his only begotten son that whosoever believeth in him shall not perish but have eternal life". The tracts will be such a blessing. My husband and I are going to the assisted living home for people who can not live by themselves but still have some independence. We went on March 19th and sang to the people there and were hoping to give them the gospel tracts. I'm not sure how many live at the Fairview home but I would guess about 30. My grandaughter and 2 other young kids are going to give the tracts out. Last time we went they went to the rooms and gave them Bibles. If you would be willing to send more tracts we will gladly help spread the gospel of our Lord. We've been serving the Lord all of our life. I can't imagine my world without God in it. Please keep us in prayer and again I thank you so much. Receiving the gospel tracts was my greatest blessing of the day. I prayer God will continue to bless you in your wonderful ministry. Our website has been revamped and expanded and we are very pleased with the new look. We hope that you find the site easy to navigate. Please check regularly for the latest news, and if you would like to receive regular updates, just click onto the feeds symbol (the orange symbol just below the tracts4u.org logo on the newsletters page).